Timing wasn't in my favor when I created this, but it will be fun to catch everyone up. June 28th was the last day of school. Which means the whole week is a bit chaotic. We had our last book buddies with our 5th graders, an ice cream party, the Spring Play, and an aperitif with the parents (champagne anyone?). On the 28th I met Ryan at the train station and we celebrated the end of the school year in London. We ate amazing Indian food, caught up with old friends, took a bike tour, and best of all saw the show the Book of Mormon. Highly recommended. We got back late Sunday night and on Monday morning I was off to 'Merica to surprise my extended family. My family was in Avalon renting a beach house with the Curry's. My Florida family also came up for the week. My dad had an 'emergency at work' and came to pick me up at the airport. After the big surprise, we spent the week getting rained off the beach, swimming with cousins in the pool, catching up on good reads (Where'd You Go Bernadette), and celebrating the 4th. Following Avalon I had a few days in Doylestown. On Sunday night I had about 10 friends from home over and it was just like old times. We got take out food and sat around the dinning room table. I'm not sure the last time we all sat around the table was, but we always all pick up right were we left off. Here's some pictures to recap of the past 2 and a half weeks. 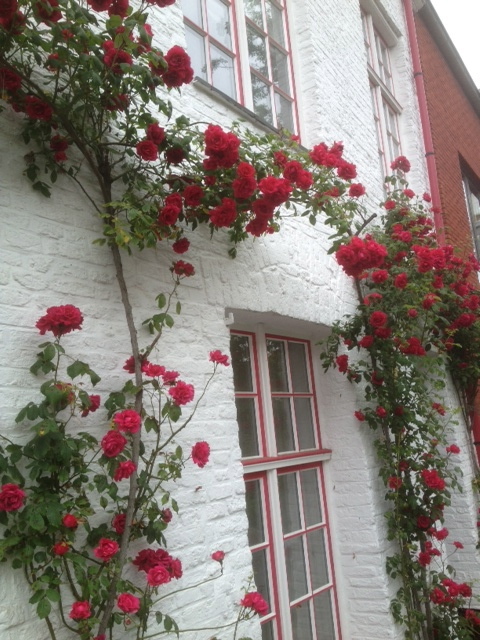 Our roses in full bloom! A local high school had a raft race, right in front of our house! Met up with Franzi (a friend from when I studied abroad)! Hope everyone is enjoying their summer and had a great 4th! I am back in Belgium preparing for our next trip, while cleaning and unpacking. This weekend is suppose to be in the 70s! Wahoo.